A mind-blowing 500 million Stories are posted on Instagram every day. Whether you’re part of the 50 percent of brands who are already creating Stories, or the other 50 percent who should definitely be thinking about it, you’re probably wondering: how do you keep your content fresh and exciting? One way is to make sure your Stories are interesting and interactive by adding features like Polls that allow viewers to engage with your content. 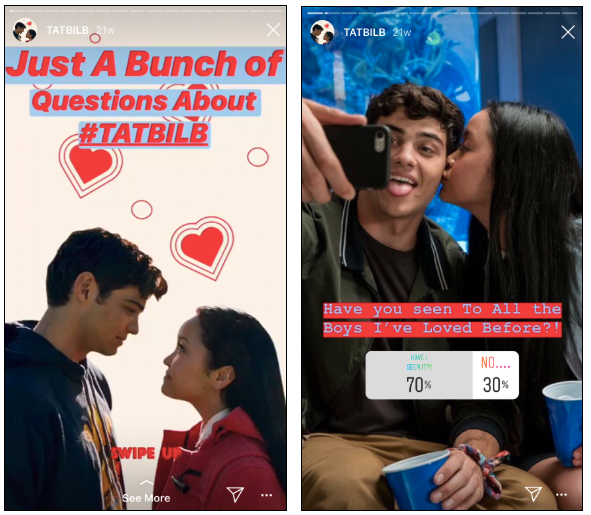 If you’re looking for some inspiration, we’ve rounded up 7 great ways brands using Polls in their Stories. Save time editing photos and download your free pack of 5 customizable Instagram presets now. 1. 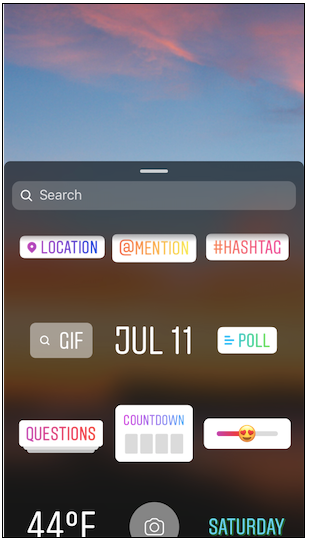 Find the stickers icon in the top-right corner of your screen, and tap the Polls icon to add it to your Story. 2. Add your question and responses. The default responses are “Yes” and “No,” but you can customize the text and even add emojis. There’s no character limit for questions, but each response is limited to 22 characters (we tested it ourselves). 3. Check your results! You can swipe up from your Story to check how people are voting in the Poll and see the total number of views. 4. Your Poll will last for 24 hours with your Story. Don’t forget to share the results with your followers after it ends! That’s one way to show that you’re listening to them and valuing their engagement. 5. If you want to keep your Poll alive longer than a 24-hour period, add it to a Stories Highlight. 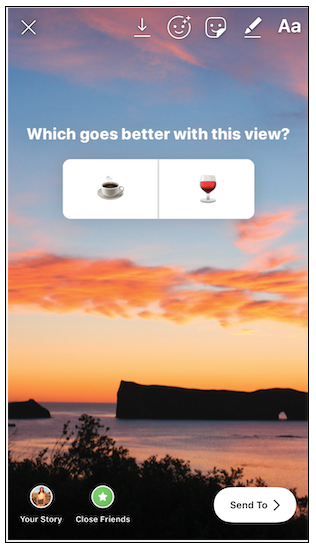 As SNL producer Lorne Michaels said, “There’s no creativity without boundaries.” Similarly, the simple Polls feature offers limitless opportunities to create fun and dynamic content. Here are just 7 examples to spark your own creativity. Media giant Buzzfeed is probably best known for their quizzes, as anyone who has discovered what kind of sandwich they are can attest. 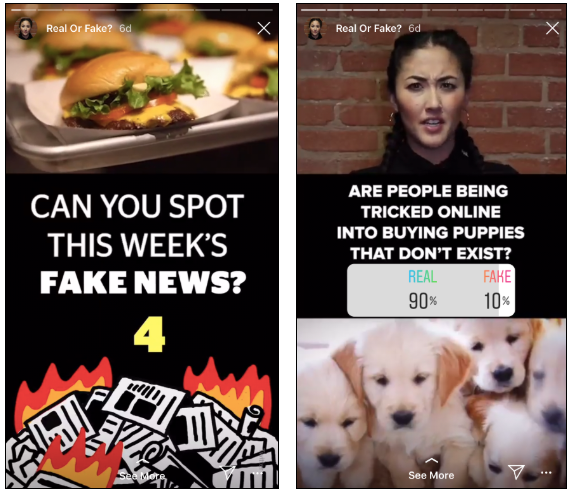 So naturally, Buzzfeed News thought to use Polls to create audience quizzes in their Instagram Stories too! Quizzes aren’t just for Buzzfeed, of course. 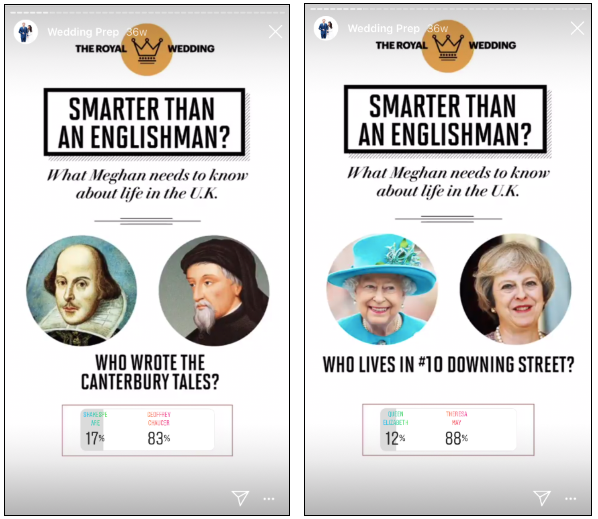 Vanity Fair also proved how fun the quiz format can be when they created a Royal Wedding quiz to prepare audiences for Meghan and Harry’s nuptials. The quiz was enjoyable all on its own (did you know daffodils are an emblem of Wales?) and also complemented their extensive Royal Wedding coverage. That’s the secret to a good quiz: making sure it contributes to your overall content strategy. The content should align with your other posts and your brand identity. “Which Hogwarts House Do You Belong In?” can work for Buzzfeed, but it might not be a good fit for you. “Show, don’t tell” is an essential rule in storytelling, and for good reason. Why tell audiences about all the amazing products you offer when showing them off makes a bigger impact? 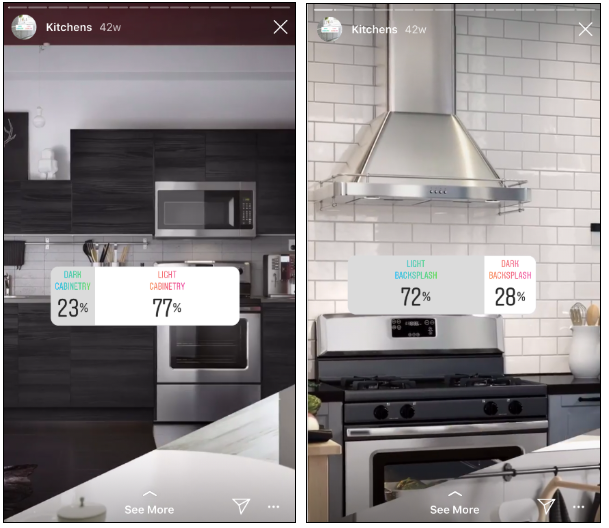 IKEA USA used Polls to show followers their range of kitchen options and asked them to vote for their favorites. This approach can work for all kinds of products, whether you make dog-patterned sweaters or sweaters for dogs (as long as you have at least two products to compare). It’s especially helpful if you want to boost visibility of a product line or a special promotion. In IKEA’s case, they were promoting an upcoming sale on their kitchen lines. The Polls drew audiences in, and were followed by a discount code and more info about the sale. This kind of product poll also provides valuable insight into your customers’ preferences. Do you ever wish you had a crystal ball so you could see what your customers really want? Well, the next best thing is an Instagram Poll. It’s a simple form of customer research that allows you to ask your audience important questions, while still providing them with quality content! For example, swimwear brand Mimi Hammer used Polls to ask customers what swimsuit designs they preferred. 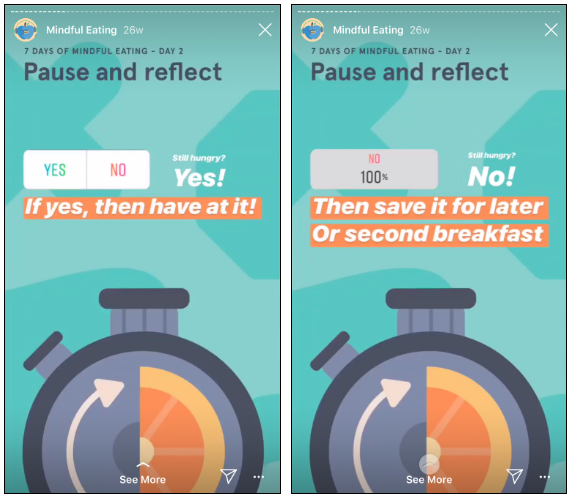 Even though they were essentially creating a customer survey, Mimi Hammer still used high-quality visuals to frame the questions. No matter what your Poll is about, you should always maintain your brand’s visual consistency and include striking images to catch your audience’s attention. Is getting audiences to click through to your website one of your social media goals? Polls can help you direct audiences to your website t! Elle Magazine did this to great effect with their Polls about Netflix rom com To All the Boys I’ve Loved Before. 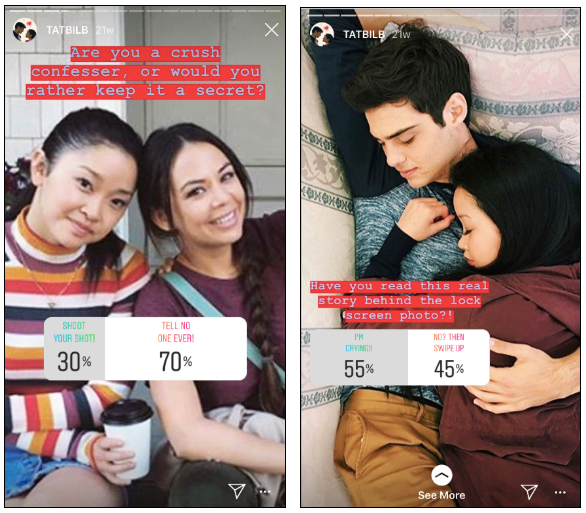 In a cute series of Polls, they teased the content of their article on the movie and provided incentives to swipe up and read it in full. Even those who hadn’t seen the movie could participate in the Poll, making it inclusive of their full audience. Audiences (especially millennials) expect brands to share their values, such as sustainability, giving back to the community, and honesty. Polls are one way to share your company’s values, and encourage followers to take action on important causes that you both care about. Refinery29 did this well when they encouraged their followers to register to vote in the November 2018 midterm elections. They ran several Stories reminding audiences about key dates and deadlines, and added Polls asking whether they’d registered yet. It also made it clear that Refinery29 cares about civic engagement and democratic process, and they believe their followers share that value. Your company may want to avoid getting into social and political issues altogether, but if you decide to engage, here are a few tips from a successful case study. Chances are part of your company mission is informing your audience about your services, products, or mission. Education is an important part of your content strategy, and Polls can be a valuable educational tool. 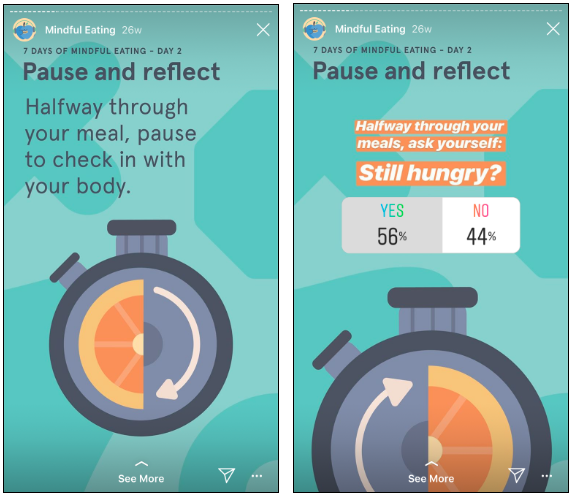 Meditation app Headspace knows a lot about this: a big part of their work is educating users about mindfulness and reflection. 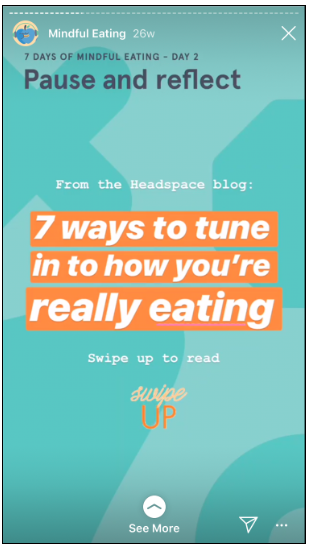 To that end, they used Polls in a series of Stories teaching audiences about mindful eating. 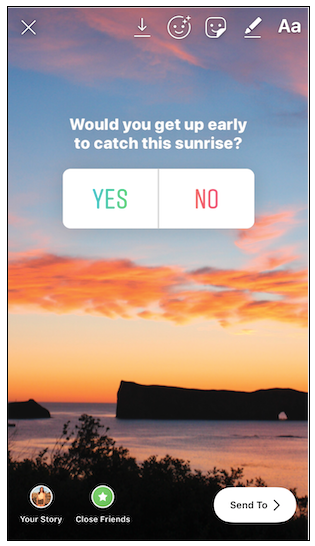 The Poll also served as an introduction to their blog content on the same topic, and viewers could swipe up after participating in the Poll to learn more. Sure, it’s important to set goals and track your metrics. But don’t forget that the reason your audience is on Instagram is because they enjoy it. Sometimes, you can keep it simple and just try to have fun with your Stories too! 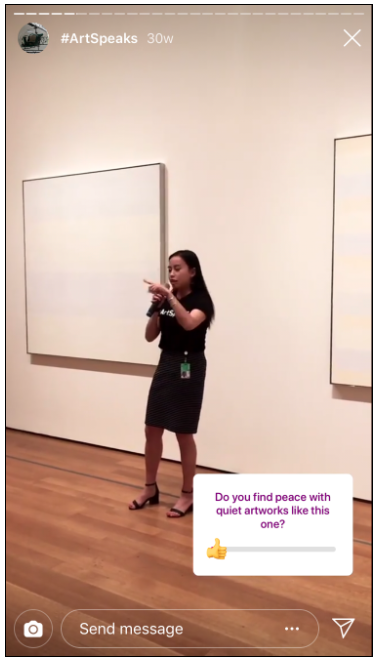 Break up a long series of Story posts with a fun Poll to keep audiences from zoning out, like MOMA did with their #ArtSpeaks series. 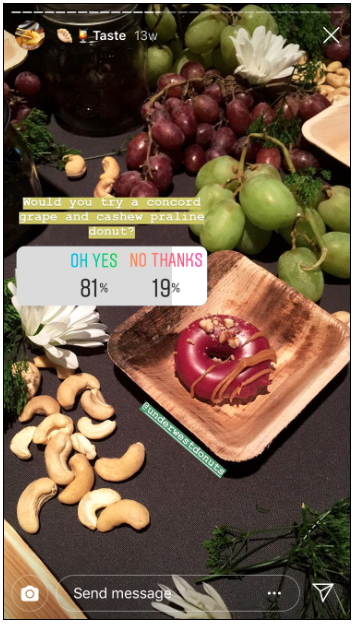 You can also dig into important topics… like Grub Street did, with their donut flavor Poll. 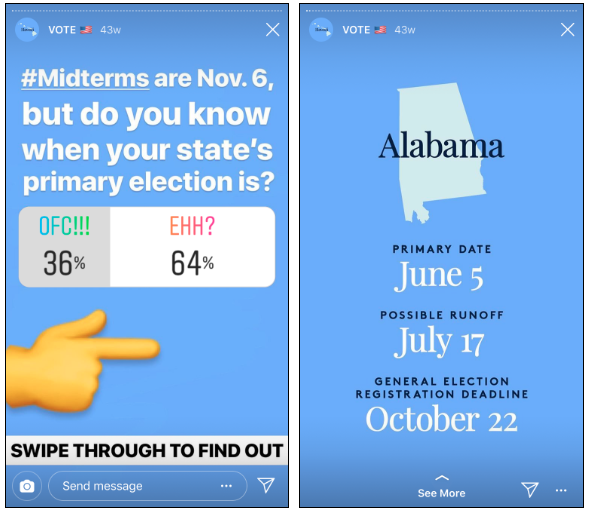 However you decide to use them, Polls are an easy way to connect with your Instagram followers and spice up your Stories. Want even more inspiration for your Instagram content strategy? 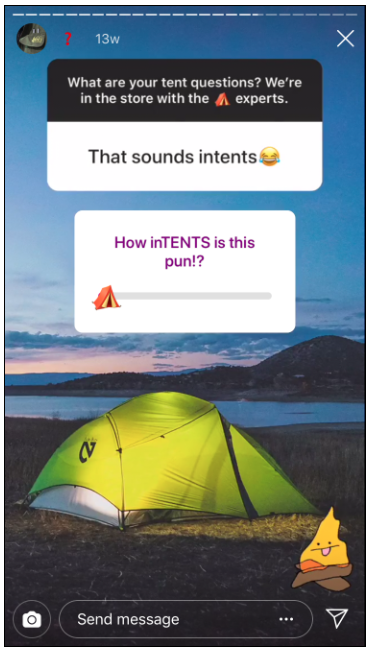 Find out how brands are using the Questions sticker, and see who’s knocking it out of the park with their Stories. Save time managing your Instagram presence using Hootsuite. From a single dashboard you can schedule and publish posts, engage the audience, measure performance, and run all your other social media profiles. Try it free today. 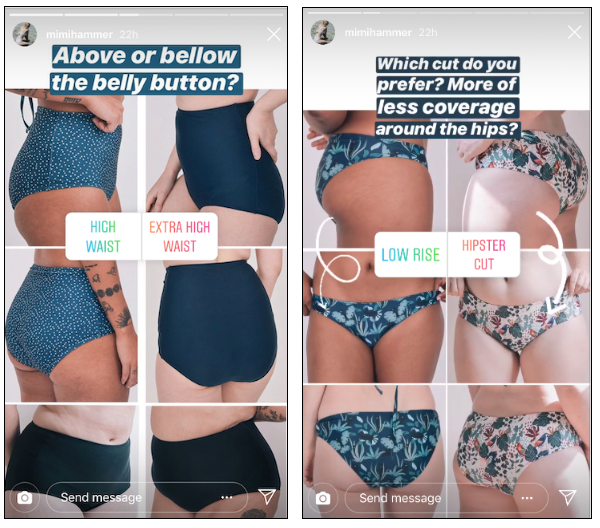 The post 7 Creative Ways Brands Are Using Polls in Instagram Stories appeared first on Hootsuite Social Media Management.